One of the biggest, most respected and revered names in drum & bass is without doubt Shogun Audio’s head honcho, Friction. 2012 is looking to be a pinnacle year for the DJ/producer as he readies not only his debut artist album but also gets set to take over the most prestigious job in the business; BBC Radio 1’s flagship Drum & Bass Show. His first single of the year is as you’d expect nothing short of mammoth; primed and ready to rock, this is polished D&B of the highest calibre. Glorious, lush string arrangements kick off ‘Led Astray’ with a vocal that seeps straight into the consciousness, while we get ready for the drop just round the corner. Suddenly Friction lets rip with the gnarliest half-time break and killer hook to smack your speakers into oblivion! 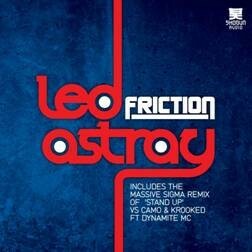 This is large, unashamed dance floor business that’ll have ravers reaching for the rafters as Friction shows his versatility, unafraid to cover all bases. For the digital only mob there’s the added extravagance too of a solid, stinking nasty dubstep remix from London’s very own Culprate. Huge!